Boom! Another birthday ride in the books, just as the month skids to a stop. Going up: The Saga tackles Tramway. A few days late, it’s true, but remember, we’re running on O’Grady Standard Time here. Anyway, today’s entry in the old logbook officially lists 40.2 miles, which is 64.7 kilometers. Naturally, I shall carry the 0.7km forward to next year’s ride, assuming I’m still above ground and not studying The Little Orange Book in re-education camp. The weather being slightly insane — 63 degrees at the start, 73 at the finish — I rode down to pick up the bosque trail just west of downtown, took that to the Alameda parking lot, and then noodled over via 4th and Roy to the Tramway climb, which always seems to take about a half hour, no matter what bike I’m riding. In this instance it was the Soma Saga Disc. Which reminds me: I get extra credit for logging my birthday mileage on a 33-pound bike, right? Right? This entry was posted on March 31, 2018 at 3:08 pm and is filed under Albuquerque, Bike stuff, Spring. You can follow any responses to this entry through the RSS 2.0 feed. You can leave a response, or trackback from your own site. Happy Birthday ride. I did a bit of a scoot today too but not 64 km. Yeah, I remember the Lamy trail from my Fanta Se days. I seem to remember tackling it on what I was using for a “cyclocross” bike back then — a Specialized Sirrus road bike that a frame-building acquaintance had doctored to accept canti posts and fatter tires. I’ll try just about anything on an an actual ‘cross bike. No brain, no pain. 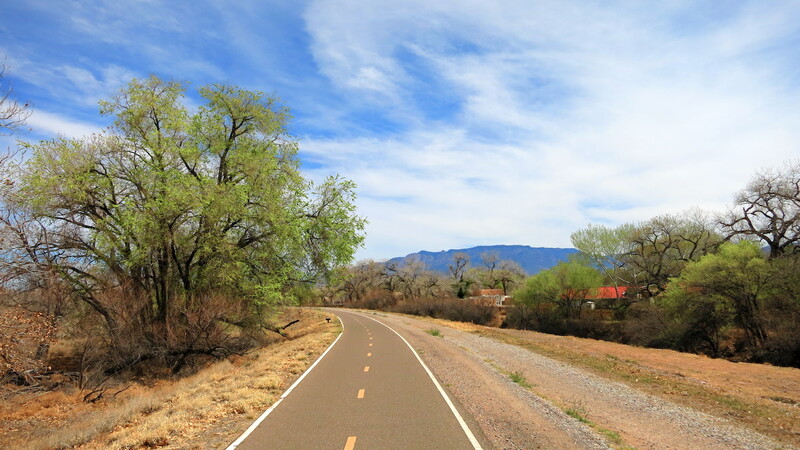 Have you ridden the La Tierra trails yet? Or the Dale Balls? Some good stuff there. I plan on doing the La Tierra trails soon. The Dale Ball trails look good but not so convenient to Estate Solana. Right! 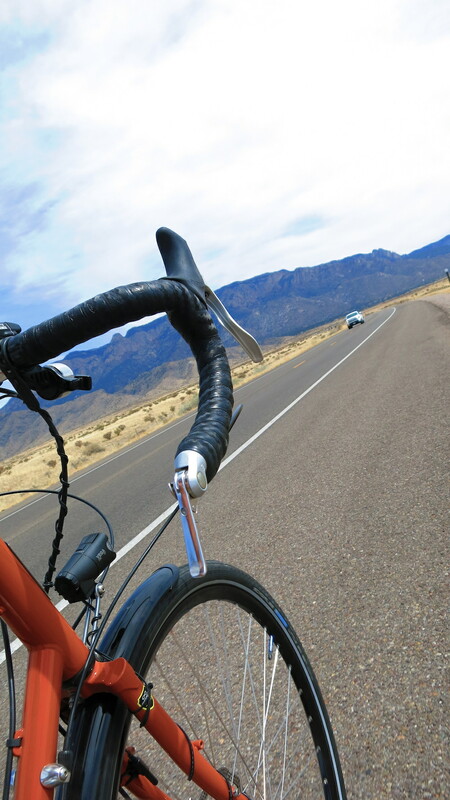 Multiply touring or fat tire bike ride distance by 1.5 to get actual cycling distance. So, you actually rode 97.05 kilometers. I rode 0 kilometers today. Back sprain is better, but not cycling better. Maybe it will allow me a ride Tuesday or Wednesday. Damn, I’m the man! 97km? Booyah. I think I added 64 kilograms’ worth of lunch afterward, too. Jeez, you really tweaked your back, hey? Do you patronize a chiropractor or massage therapist? Sometimes a laying on of hands helps. My tandem riding buddies, and neighbors, includes a retired physical therapist and yoga instructor. She came down yesterday and aligned my wheels since my pelvis was listing to the left. It was a muscle or ligament strain/sprain on the right side, so not much else to do, besides rest and icing it every three hours, but let it heal. Aha. We should all have such neighbors. We have a UNM researcher next door. Maybe he can figure out who peed in my gene pool. Thanks, Libby. It’s tough enough just pulling the wee beastie off its hook in the garage. Even more so putting it back. Did a mile Century in 4 hours yesterday myself.